No Longer A Contributing Ninja/Member. another one to join my hit list under the g-pak. Ok I can answer 2 of these. The metallic blue car would be Windsor blue. Only 2 were made, one with chamois trim, the other with black. I can tell you this guy doesn't own the car anymore, and if it's the one with black trim, then I was told it never had the silver paint out on the rear. Maybe the owner painted it black at some stage. The car is now back in Tassie. There is an odd conection here because the new owner, happened to own the ex group C hatch you speak of. It wasn't HDT, it was Garry Rogers car which is now restored back to it's race trim and living here in NSW. Sounds interesting Reda9x, I havnt seen that blue A9x in 20 years but I am nearly positive it had silver paintouts, I thought it was a lighter blue than windsor blue, maybe it wasnt metallic (Ithought it was).It had 10" hotwires all round. I am going home in a couple of months so I will ask my mate who works with the owner in the logging industry what happened to it, I remember his house burnt down years ago so I hope it wasnt involved in that. Do you have any pics of the Garry Rogers car as I would like to have a look. There used to be quite a few collectables getting around over there Ill try to remember a few more, Some one said a few years ago that the Harringtons still had some of their old roadways race cars still locked up in Hobart, I dont know if this is true or not. cheers Brett. Reda9x, that supposed blue car has had me thinking all weekend, after a lot of looking at the cars on the web I think now It may have been the metallic green, like I said it was 20 years ago and I only remember seeing it once or twice in passing. I just talked to my mate in Tassie and the 4 door a9x that I first thought was blue was in fact metalic green and was sold a few years ago to someone on the west coast of Tassie he thought. so hopefully it is still about. Im probably a bit young to remember these cars but I can tell you that there is still a few L34's and A9X's in Tassie at the moment, I wont use names but there is a Couple of Yellow L34 Sedans, a guy has 2xL34s Gold and Orange, The is also a White one I know of. A few A9X's aswell locked away in sheds, a Palais white A9X, Sopher Mint Green A9X, Atlantis Blue A9X and also a A9X Hatch which was a production car and still has the original HDT Colours with the marlboro Decals, ect, ect... There was also a real nice metallic Green L34 which was sold and went over the the mainland, he then bought an Orange SLR 5000 whihc I think has also been sole now. Most of these cars have been on Torana runs which we have organised and I have loads of pics, but just have to find time to put them up. 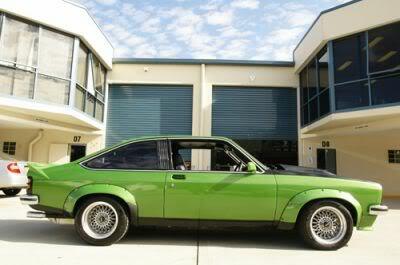 There is definately some nice Toranas in Tassie hiding away. Location:What!! Cant Ya Hear Me?? There are a couple of Tassie cars on www.my105.com at the moment. I believe the Green A9X you speak of is in fact on the West Coast of Tassie. The new owner has in fact restored the vehicle to its original condition and it now lives in a secure garage inside an humidy-crib thing. Constant temperature, constant humidity etc etc. I also know of an Orangey coloured L34 in a garage not far from my home that is a bit second hand at the moment but being restored. A mate of mine has the original engine out of the same car sitting in his warehouse. There is also another immaculate L34 not far out of Burnie. Was owned by my old boss for a period. He manufactured the twin weber manifild for it and ran a couple of hillclimbes in it before a friend of mine convinced him he should part with it. They are definately out there and apparently moreso in Tassie!! Just a ashame that I cant afford to buy them all up and put them in a shed for myself!! BTW, the A9X Nationals is going to be held in Tassie this year. great reading this thread, also from Hobart and over 40 I can remember seeing the garry rogers car driven about in the early 80's on the street. 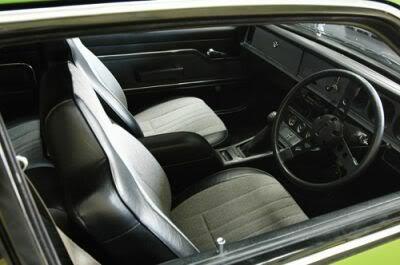 There was a four door a9x metallic green with hotwires in a car yard in argyle street for 10-12k, too much for a 19 year old then (c1983), heard it was sprayed recently and bought by a western australian. The l34 on 105.com was a street car for years here before returned to track duty, the blokes brother at the time owned a red l34 that was rumored to be A.Grices bathurst wreck had all tags looked at it 4 sale for 15k in 1989 it sat in a car yard for months in new norfolk prior to that owner.. Also went to melbourne i think. A bloke to talk too would be john brookfield who did a lot of engine work for the HDT he worked here for years knew his 308 stuff. Partners brother still has his LX 5000 sedan 30 years on. The roadways l34 and group c commodores sat in the roadways shed for years and have been sold Iv'e heard. One of the HDT l34 sedans was here and raced in circuit events sold on in 1994-5 to victoria.. Also a four door a9x in tuxedo black white trim that was ordered new by a doctor on the east coast used to be a regular streeter and was very original and clean sold also to mainland. Any one else get the brain working from this. to add a little more to the above, also know that an l34 sedan bought from melborne in 1989 now painted orange raced in targa a few years back still going strong. And most would know that brockys 75? bathurst winning car came here returned to street trim was painted black and stolen or written off late 70's I think never seen again. now sold to mainlander rego was zz5000 think. Was also a bathurst xu1 silver and also a purple bathurst one driven about in the 80's supposedly still hidden here. There is a black A9X sedan with chamois trim that came from Tassie up here in Sydney with low km. I also remember a metallic green SS(A9X?) in Hobart at the time. It was in a car yard & I droold over it for weeks but couldn't come up with the $s. I eventually brought my SLR from Hobart not long after. I also remember the Roadways yellow L34 sitting in their showroom in '79 for sale @ $10k. There's also my mates A9X ultra blue 4 door that is supposably still in the state too. Edited by Eagle, 04 February 2006 - 04:08 PM. I also remember a metallic green SS(A9X?) in Hobart at the time.� It was in a car yard & I droold over it for weeks but couldn't come up with the $s. We can all drool together on supermint. One of my favourites to. Edited by Toranavista, 04 February 2006 - 07:59 PM. thought of another one for you ci0308, an l34 barbados green all original very low k,s Hobart based the guy has had it since nearly new I think it had gold highlighted hotwires on it last time I spotted it . a close friend has been in it, the owner loves it too bits, wont mention his name. just to blow tassies trumpet what about the monster circuit racer that cleaned up the national street car champs in the 90's more than once, beating the best from the big island, the gold 4 door with 350 chev not sure think it was an LX ?. Was for sale last year for 26k still here i think. Yes I know the one, he was the workshop manager for mitsubishi in Hobart, I think he has had it since new, you never used to see this one on the road. Edited by CI 0308, 06 February 2006 - 08:57 PM. Hello Brett, thats the man and he actually has had it at tarmak a few times on circuit slicks 13.4 1/4s in the 80's from memory. I think the guy you are talking about is Roger Hurd... Ran his Torana in Improved Production (then club cars i think) and won the state championship a few times.... Great driver and a very nice car - does anyone know who bought it? I am not 100% sure but I think this was rogers car. The previous owner of my car was building it to outdo his car, but never got it finished. The name on the window reads "Kolodziej" who ever that is ?? Edited by LXChev366, 10 February 2006 - 11:55 AM. Funny how they turn up every now and then, this is the green 4 door I was talking about, bloody nice car.